I was surprised to learn (after killing many skeletons in 1.4) that it’s actually only the Wither skeletons who drop heads in survival mode. Sadface. All mobs (with heads) should drop their heads, albeit very rarely. They are such cool decoration blocks! I was by no means the first or only person to suggest this. In the comments some people also suggested that you could obtain heads by destroying spawners and that the heads could be used as ‘scarecrow’ objects to ward off those kinds of mob. It would be useful – especially on servers and in large worlds – to be able to find out when the terrain you are standing on was generated. For example, if an extreme hills biome was generated before 1.3, it is a waste of time looking for emeralds. You’d also be able to judge if it was worth exploring a desert or swamp for structures. With hindsight, this would be difficult (or imposible) to implement and would give very limited benefits. In new villages, there is a chance that one of the buildings will be a witch hut. While there is a witch, no villagers will trade with you, and as long as the hut exists new witches will spawn to defend their village from you. Perhaps she even has an ‘evil’ Iron Golem henchman. When you kill the witch and destroy the hut, the villagers are grateful (the Golem becomes neutral) and you can trade. Currently players and mobs can fit through the gap between a cobble wall and a fence. This inelegant method is the best way I know to patch the two together. It seems like they should just go together, like fence gates do. Item frames would be great for storing special items you want to have easy access to. For example: display your sword collection so you can quickly choose the right one for your task (Smite V for a nighttime stroll or Looting III + Fire Aspect II to harvest leather and beef). No need to rummage around in chests. Also, instead of flying out, the item would go straight into your inventory. Shift+Right-click would be used to rotate items in the frame. I know this is not original, but I like the idea a lot. The Blaze rod can be used anywhere a stick can, and will supercharge the crafted item in cool and useful ways. 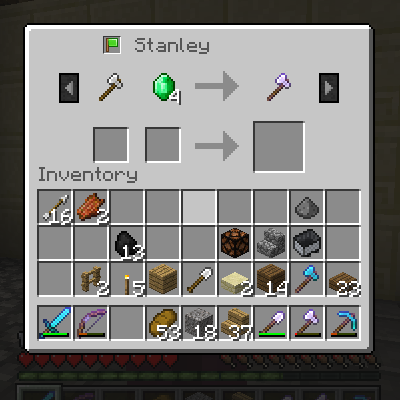 Blaze pickaxes auto-smelt ores, so mining iron and gold drops ingots. This is another idea that seems to come up a lot. I hate accidentally playing on peaceful in my regular world because I’ve just been in a creative world building and have forgotten to change the difficulty back to hard. It would be great if each world remembered its own difficulty setting. A crafting recipe that lets you create poison-tipped arrows (or instant-health arrows, or whatever you want). Of course, as it stands Minecraft only has one type of arrow. If you add more, you’ll need to figure out how to tell the game which ones you want to fire. Perhaps you have to place the arrows you want to use on your hotbar, and the game will fire those first, giving preference to those in lower-numbered slots. If there are none on your hotbar, the game will fire the most powerful arrows first. …And they would close the doors behind themselves. Regular zombies would continue to bash at doors. Rationale: If there’s one thing a Villager knows how to do, it’s open and close doors. Doors are fundamental to the life of a villager so much so that doors even regulate their breeding. It seems logical that even after they have come back as a mindless zombie, they would still instinctively know how to open doors! Further thinking: Zombie Villages! Perhaps more of their Villager personality lingers in their undead brain and at night they instinctively shelter in a village house, coming out at night to roam. If you were to leave a village unprotected, its entire population could become zombified but the village would stay occupied, meaning they could be cured en-masse. Zombies would still be unable to open iron doors. At the risk of over-thinking this point, here’s my logic: It’s not about what the villagers have learned, but what they know instinctively as a species. Zombies in films can’t drive cars, but they can walk, climb stairs – and in Minecraft they can even seek shelter from sunlight. I’m suggesting that doors are so fundamental to Villagers that they instinctively know how to open and close them, even when the knowledge they had as living beings has gone. It is a daft premise, but that’s why I like it. Librarians could sell a variety of written books that would help new players learn the game and also provide a useful reference for experienced players. The books would be written from an in-game perspective in semi-cryptic language, but would still be very helpful. The first books could appear in the spawn chest, if the player chose to have one. Otherwise Librarians would start by offering basic guides first and more advanced volumes would become available later. When Mojang add new features, Librarians would have new books covering these new subjects. Books could also be found in chests and as rare zombie villager drops (ex-librarians!). Why? As it is, the PC version of Minecraft cannot be learned from scratch without consulting the wiki or YouTube videos. This would bring all the information in-game. It would also make for a fun collectable item. People often suggest that bookshelves should be able to store books. This would be an even nicer feature to have if the player was being encouraged to collect books. It would be fun if the books had illustrations too. Admittedly a new player wouldn’t be able to completely rely on these books to help them learn the game, but they would still be a great way of helping people along. Combining with zombie flesh makes your armour a reddish-brown and also makes you stink like a zombie. Therefore, zombies will ignore you (unless you attack them). Bonemeal (white) hardens the leather and provides a projectile protection effect. Gunpowder (grey) could give blast resistance, though I realise that doesn’t make much sense. It’s magic! Spider eye (dark red) could give you an immunity to (or at least counter the effects of) spider poison. Also, ink sacs could give a kind of aqua affinity effect. And, um, feathers on boots could provide feather falling? Why? To get some enchantment-type benefits earlier in the game. Also to make leather armour more appealing to more experienced players. Note: These would all be low-level enhancements, no greater than level 1 enchants at most. This special sign could be naturally occurring in villages, in ironmonger chests or displayed on churches. It might display a random (and editable?) village name, plus an automatically updating population count so you can see at a glance how well your village is doing. In the comments someone suggested that the sign should be placed on the well, since every village has one. Lancework is the art of writing words (and creating pictures) with fireworks. You could make these work in Minecraft by adding a written book into the firework recipe. Obviously there will need to be a character limit, so perhaps only the title of a book would be displayed. Alternatively, they could be made by renaming fireworks in the anvil. This is an odd, half-formed idea, but bear with me! There should be a mob in the game that you must never kill. A passive mob. Maybe a narwhal or a butterfly. You can kill it, and perhaps it drops diamonds or a nether star or something else unique and magical, but if you do murder this helpless creature then bad things will happen to you. Perhaps Endermen will stalk you for days. Perhaps you’ll be teleported to a distant, unexplored part of your world. Perhaps the sun won’t rise for a lunar cycle. Perhaps you’ll go blind. Perhaps all the enchanted items vanish from your inventory. Perhaps you leave a trail of fire behind you for the next whole day. And perhaps once you kill one, none of them ever spawn in your world again. I don’t know. Bad things. One of my favourite ideas. Make your fireworks a little more magical by enchanting them! Persistance: The display hangs in the sky for much longer. Darkness falls: The daytime skies darken, like a solar eclipse (or like how the skies change when you fight the Wither). Clear skies: Any rain/snow stops. Stormy skies: Instant thunder storm. Shake the ground: The firework is extra-loud. Perhaps it even deals half a heart of damage to anyone nearby. Vortex: The firework particles swirl around in the sky, something like a tornado. Fireflies: The particles move around like a swarm of insects. Ghastly noises: Instead of making a loud bang, the firework screams like a Ghast. Ender exploder: Looks like Enderman particles. Disappears several times, reappearing elsewhere in the sky. Starry skies: At night, the stars in the sky all brighten and twinkle as this firework explodes. Shoot the Moon: If visible, the moon will glow extra-brightly and/or change colour, as will the surroundings (from light level 4 to 8 maybe). Great balls of fire: Several fire charges shoot out of this explosion and could catch fire to what they hit. Enchanted shower: XP rains from the sky. See also: My other idea for spelling out words with fireworks, that could possibly be another enchantment. Enchanted fireworks could be crafted with an anvil rather than an enchanting table. In one slot you would place the firework and in another a token – for example, a Ghast tear for Ghastly Noises or Redstone for Persistence. Beast Burner I, II, III: Any mobs in range catch fire and take damage. There could be one version for hostile mobs and another for passive. Power Shower: A firework can be equipped with any splash potion and will rain down that particular effect, giving any players and mobs nearby a short dose of strength, weakness, speed, night vision or whatever. Breadcrumb Trails: (Crafted with bread!) The rocket shoots up and then heads off in the direction of the nearest beacon. Useful when you are far from home. Strange Attractor: Mobs look up at this display and are drawn towards it. Feed the World I, II, III: Crafted with bonemeal, this triggers a downpour and any crops in the area have a chance to grow instantly. The more levels of XP you put into this, the more instant food you get. Flowers and scrub grass would also proliferate. Snow Joke: Starts a short, localised snowfall. Snow gathers on the ground, even in desert biomes. Spidery Surprise: A display that looks like eight black legs with eight red eyes. Could also deal a poison effect to close players. This one got a fairly high number of downvotes, which I didn’t understand since it sounds very cool to me. It is possible to vote down a suggestion from the front page without ever reading the description, so I imagine that happens quite a lot. Summary: This is a craftable wallet (or purse) that can only be used for storing high-value currency items and has Ender-chest-like properties. You will be able to keep your diamonds safe even if you die in lava or are murdered by a SMP thief! The wallet can also be used to initiate a trade with another player in SMP through an interface that will guarantee that neither party can flee without paying for their goods. You craft a wallet with 8 leather and an Eye of Ender. While the wallet is in your inventory, it adds an additional three slots. You can craft multiple wallets and they’ll contain the same items. If your wallet is lost or destroyed, your precious items will still be safe and accessible from any other wallet. To trade, you right-click on another player while holding your wallet. To prevent trolling, the other player also has to right click on you at the same time, holding their own wallet. A special trading window opens. (See mockup). Your inventory (including the wallet slots) are along the bottom as usual. You place items you want to trade in any of the four slots on the left and click ‘Offer’. The other player does the same and you will see their offer on the right. This activates the ‘Trade’ button in the middle. Both players need to click on this to complete the deal. Upon completion, all traded items exchange automatically and the window closes. Benefits: There are several nice features to this. Firstly, players can negotiate without having to use the chat. Secondly, there won’t be any need to throw items on the ground to give them to another player. Thirdly, you won’t be cheated by a player who grabs your treasure and runs. About the mockup: This picture shows the wallet (to the left) and the trading interface. I know enough about interface design to know that this needs more thought put into it, but I think it’s good enough to convey the general idea. Wallet items: I’m suggesting restricting the kinds of items that can be stored in a wallet to prevent them from simply being used as an inventory extension. It may be appropriate to allow other high value items, like Nether Stars, books (could contain valuable info or be enchanted), maps and potions. Theft: There may be ways to steal from the wallet of another player however. For example, if you kill a player with a looting sword you might get a percentage of their goodies. Extending this idea, now that the Looting enchantment could be used on other items, they could be applied to shears and used on players to grab a few items at random from their inventory. I’ve since gone a bit colder on this idea. It’s a fairly complicated solution for something that’s not really a big problem, and even then it would only benefit SMP users. I like the wallet idea, though even that would only serve to make the game easier when – if anything – it should be more challenging. Summary: A new flower with special redstone properties that would help simplify the creation of popular and useful Minecraft inventions. Either found naturally or crafted with a red flower and 8 redstone dust. The flower will die without a light source and must be planted on a grass or dirt block. When exposed to sunlight the plant emits a pulse (one tick) of power at regular intervals (eg. one per minute) throughout the day. When lit by glowstone, it emits the pulse less frequently, but constantly (every 2 minutes without interruption day and night). The flower delivers power to surrounding blocks like a redstone torch does (except only as pulses at regular intervals). These plants would open up many possibilities for redstone users, most significantly the ability to easily create reliable timers and reliable day/night sensors. The flowers could glow like a redstone torch (light level 7), and have the same particle animation. If planted in daylight and next to glowstone, the plant would pulse more quickly at day than at night, as per the rules described above. Perhaps the pulse rate could be altered in other ways too. For example, if planted on a tilled and watered block, the speed could double. If planted in soul sand, the pulse rate could be slowed by a different factor. Maybe halved. If planted in the Nether, the flower emits a random pulse, with the gaps being as short as 10 seconds and as long as two minutes. I wasn’t aware when I wrote this, but Mojang are actually adding a daylight sensor in the next update. It’ll be a very cool feature to have, but I feel that mine is somehow more Minecraft-y. Like players on a server, their names would be displayed above them. This would help with finding a specific villager who you want to trade with. Perhaps their names could even use the standard galactic alphabet so you can’t read them, but you can still recognise them. Inspired by this suggestion from gmfreaky – I think this idea is much simpler and serves the same basic purpose. Edit: Here’s a mockup of a way to make the floating nametags optional, per villager. You would click the flag button to make his nametag appear above his head so he can easily be tracked down. When he no longer has good deals, you can deselect the flag button, and he’ll go back to just being another villager. Along with your character skin you can optionally design your own leather, iron, gold, diamond and chain-mail armour textures. You would upload your textures to the Minecraft server the same way you do character skins. This will help you bling up (or blend in) when kitted out. There is potential for abuse of this feature. For example, players could use transparent textures to appear un-armoured and therefore weaker than they really are. Or they could make leather armour look like diamond armour, etc. Therefore servers would need an option to override custom armour. Since I suggested this Minecraft has made it possible to dye leather armour. …will occasionally spawn new items. Mainly so players who like to play on long-lived worlds can obtain new items, like enchanted books, without having to travel and explore new chunks. Also as an incentive to keep around mob spawners and a practical use for mossy cobble. Fresh loot would spawn fairly rarely, but you could increase the value of items that appear by fighting the mobs that spawn. Perhaps instead of loot coming from nothing, the chests function as a kind of ‘loot trading system’. For example, if you place a book in there, eventually it gets enchanted. In conjunction with another suggestion I just made that torches placed near mob spawners should ‘burn out’ after a few minutes, this could make dungeons more interesting again. Very rarely there should be a storm so bad it rains fish. It could also rain other junk, like ink sacs, bones, sand and Ender pearls. But probably not cats and dogs! Given that raining fish is a real phenomenon, I’d argue that this is realistic enough. Especially in a game with an exploding monster, teleportation pearls, a hell dimension, magic potions and enchanting etc. I like the idea of tamed animals, but they can be very annoying. I’d prefer if you could give each pet a basket (a bed) that becomes their ‘base’. When given a basket, these animals would behave differently. Rather than follow you around, they will stay near their base but still roam freely around the immediate vicinity, stopping at perimeter walls and fences. Dogs could either be trained to attack mobs or remain passive. Cats presumably would sleep most of the day and kill the odd chicken. I’m sure animal lovers would prefer this to the current model of just having animals sat on the spot indefinitely. Variation: Instead of a basket, the item could be a bowl that functions like a small chest. You need to keep the bowl stocked up with food to keep the animal alive (one steak per day, or something like that). When you place the bowl, it could function like a sign and allow you to write your pet’s name on the side. I’m sure everyone here knows about Sonic Ether’s shaders. Personally I think they’re a bit extreme to be suitable for vanilla Minecraft, but the glows alone would be a nice addition to the game. It makes glowstone look about a million times nicer (IMO). What? When you place a torch near a mob spawner in a dungeon, it magically burns out after a few minutes. The torch would either ‘pop off’ and float as an item, or simply disappear. Why? In game logic, it would be the ‘evil forces’ that bring the monsters into being working against you, or something. I’m suggesting the idea though to make the dungeons a bit more challenging. Of course, a player could still make the dungeon permanently safe by destroying the spawner. In addition, glowstone and redstone lamps should be immune to this new effect. It’s too easy to kill a hostile mob at range with a bow. Once struck, they should run around (either in confusion, panic or deliberately taking evasive action). Smarter mobs (skeletons maybe) could even walk towards the direction the arrow came from, seeking out their attacker. In the 1.5 update, some significant changes have been made to mob behaviour. Skeletons will shoot faster as you get closer to them, and now when one zombie spots you and heads your way, other zombies will follow it also. Add bonemeal into water to make crops grow faster (but not instantly). A white particle effect would show that the water has been fertilised. The effect would only last for a limited time, but long enough for multiple harvests. Any crops within hydration range would benefit from the speed boost. This would work on wheat, pumpkins, melons and would encourage larger than average trees. In the next Minecraft update (1.5) we will be able to apply bonemeal to plants from dispensers, which is very cool but I think I prefer my idea. The Brain Bat lives in the skull of a small percentage of mobs, feeding off their energy. When the mob dies, it flies out and seeks another host – perhaps you! You can’t easily tell which mobs are infected in advance, though perhaps this creature should be limited to hostile mobs in the Overworld. I’m thinking it should have a certain Alien chestburster/facehugger vibe when it comes bursting out. Additionally, infected mobs will be a bit stronger (or faster). It might be interesting if they behaved a little differently too, like maybe two infected mobs will fight each other (or join forces!). I dunno what they should drop. Brain pieces might be an interesting potion ingredient? I’m also not sure if they should be able to attack you outside of a host – after all, it’s not like they can take over the player. NB: I realise that Brain Bat is a dumb name. It’s only a placeholder name to describe a flying mob that lives in a brain. This was inspired by a suggestion from WutsHisFace777, and I think a combination of these two ideas could lead to something even more interesting. I’m still fond of this mob idea: The creature would be similar to the silverfish and bat mobs, but very different. I’m all for any changes to the game that make it more challenging, scarier and enhance the mythology. Generally speaking, I’m all for any changes that make the game more challenging, scarier and enhance the mythology. Minecraft doesn’t (and shouldn’t) have the type of mythology that World of Warcraft or Skyrim has, but I’d still like to see the pieces of the puzzle put together in a more coherent way. Where do Creepers come from? Who made the strongholds? Why are villagers so helpless? Why are there zombie pigmen but no pigmen? It would be nice if the game filled in some of these gaps, not by literally answering the questions but by presenting more clues in the form of new mobs, places, dimensions, structures, biomes and the like. Note: I’ve included the reddit ‘score’ alongside each post. This is essentially all of the upvotes garnered, minus all of the downvotes. It’s in a constant state of flux however, even on the old posts, so the numbers here are just a snapshot of where they were when I wrote this. These ideas are listed here in the order that reddit’s ‘interestingness’ algorithm presents them. In other words, if a post has a lot of upvotes and downvotes and comments, then that’s a sign that it is more interesting. This entry was posted in Geeky and tagged gaming, Minecraft by Geoff. Bookmark the permalink. You know what i would want? colored beds since stained clay was implemented in minecraft colored wools doesn’t have a good use anymore so maybe you could use colored wools as the same crafting recipe for a bed and having the color from the wool! Hey I have a idea to add GLSL Shaders mod to the next uptade or in this uptade that makes minecraft looks allot nicer and be sure u will add the shader packs function . I think we should be able to dye wood blocks. That way you don’t have to use wool or clay. I also think we should have “sheep meat”. Like, you kill a sheep and you get wool and meat.